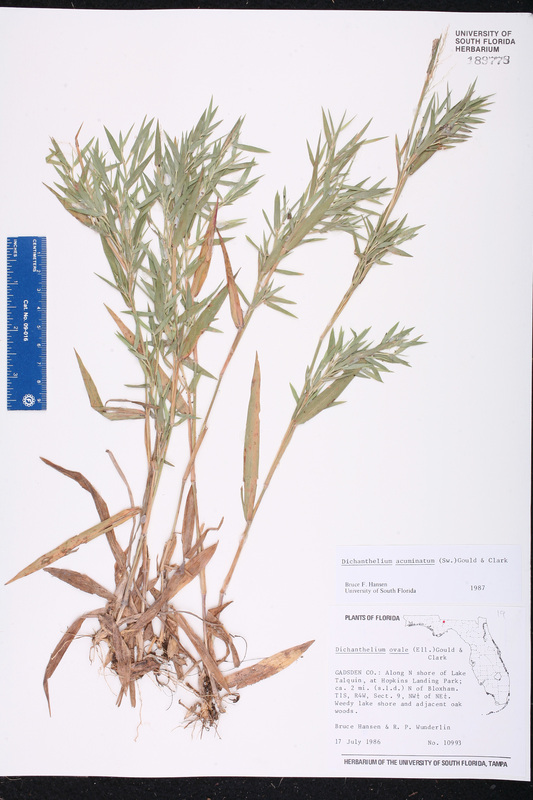 Citation DICHANTHELIUM ACUMINATUM (Swartz) Gould & C. A. Clark, Ann. Missouri Bot. Gard. 65: 1123. 1978. 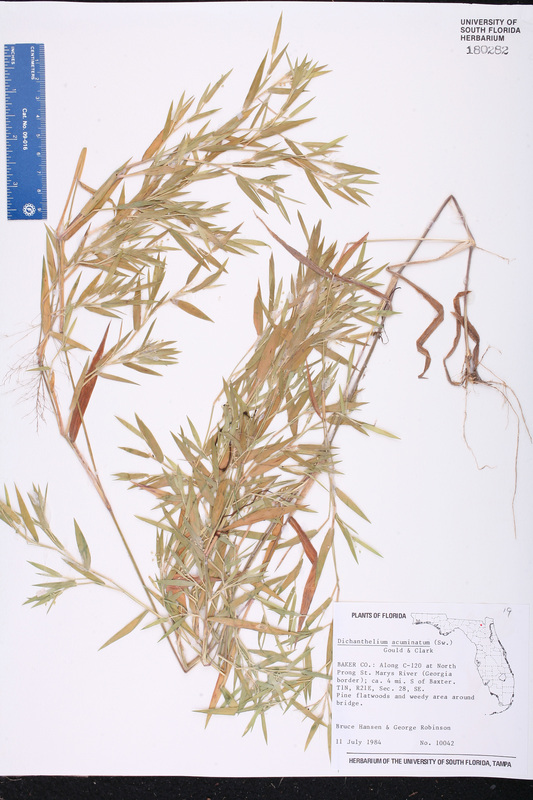 Basionym: Panicum acuminatum Swartz 1788. Type: JAMAICA: Without data, Swartz s.n. (holotype: S; isotype: US fragm). Dichanthelium acuminatum subsp. 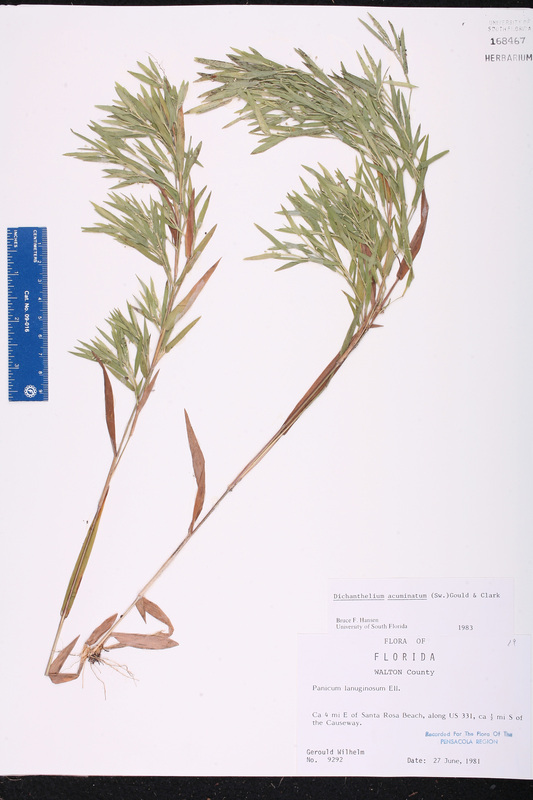 fasciculatum Dichanthelium acuminatum (Swartz) Gould & C. A. Clark, subsp. fasciculatum (Torrey) Freckmann & Lelong, Sida 20: 167. 2002. 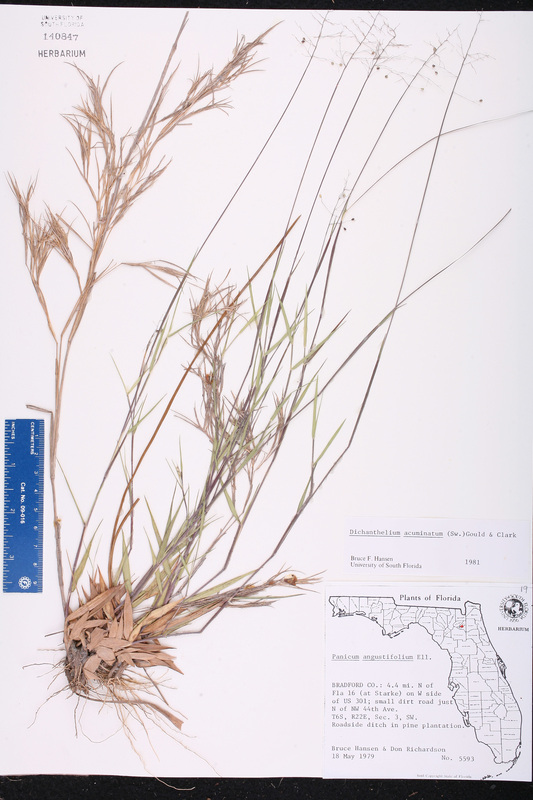 BASIONYM: Panicum dichotomum Linnaeus, var. fasciculatum Torrey 1824. Dichanthelium acuminatum subsp. 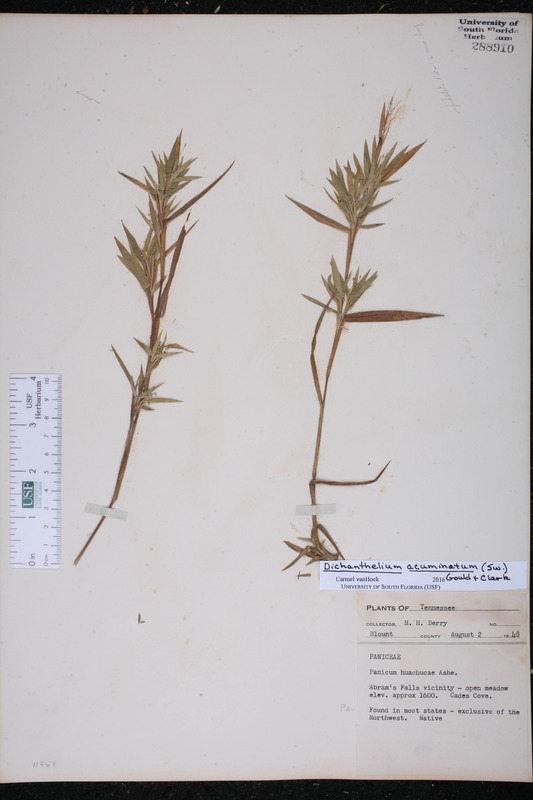 implicatum Dichanthelium acuminatum (Swartz) Gould & C. A. Clark, subsp. implicatum (Lamson-Scribner) Freckmann & Lelong, Sida 20: 167. 2002. BASIONYM: Panicum implicatum Lamson-Scribner 1898. Dichanthelium acuminatum var. 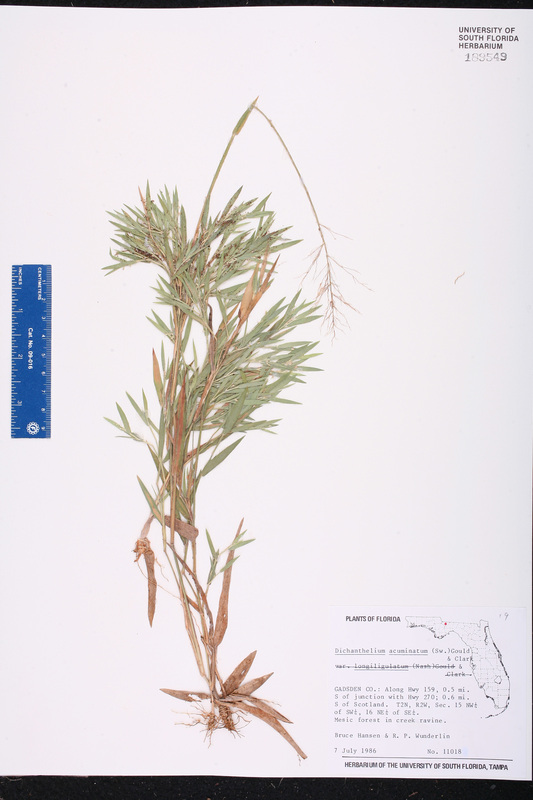 fasciculatum Dichanthelium acuminatum (Swartz) Gould & C. A. Clark, var. fasciculatum (Torrey) Freckmann, Phytologia 48: 108. 1981. 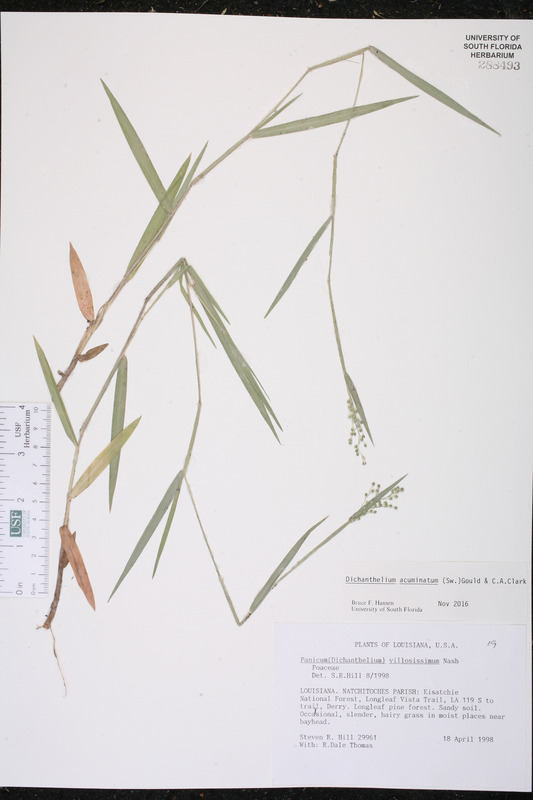 BASIONYM: Panicum dichotomum Linnaeus, var. 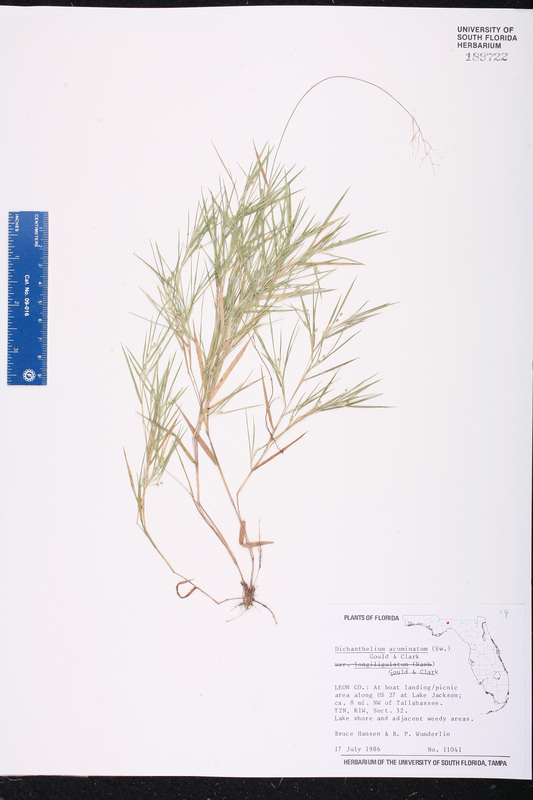 fasciculatum Torrey 1824. Dichanthelium acuminatum var. 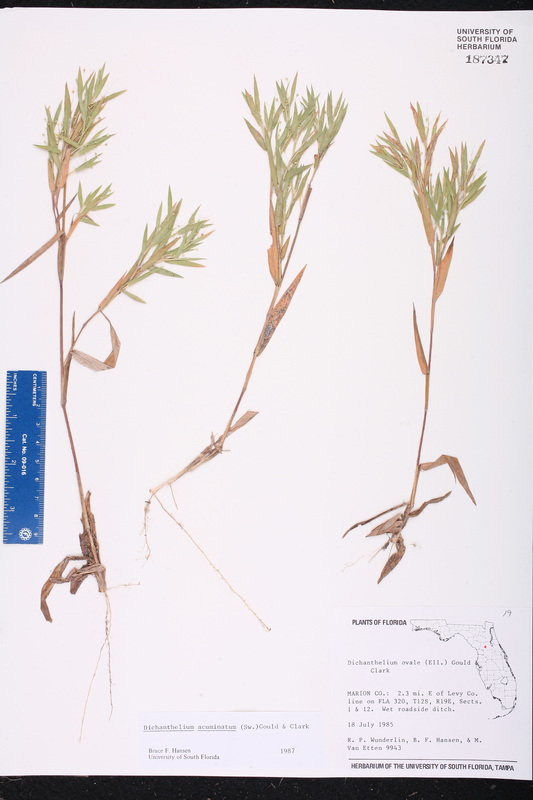 implicatum Dichanthelium acuminatum (Swartz) Gould & C. A. Clark, var. implicatum (Lamson-Scribner) Gould & C. A. Clark, Ann. Missouri Bot. Gard. 65: 1126. 1978. BASIONYM: Panicum implicatum Lamson-Scribner 1898. Dichanthelium acuminatum var. villosum Dichanthelium acuminatum (Swartz) Gould & C. A. Clark, var. villosum (A. Gray) Gould & C. A. Clark, Ann. Missouri Bot. Gard. 65: 1124. 1978. BASIONYM: Panicum nitidum Lamarck, var. villosum A. Gray 1835. Dichanthelium commonsianum Dichanthelium commonsianum (Ashe) Freckmann, Phytologia 39: 271. 1978. BASIONYM: Panicum commonsianum Ashe 1898. Dichanthelium lanuginosum Dichanthelium lanuginosum (Elliott) Gould, Brittonia 20: 60. 1974. BASIONYM: Panicum lanuginosum Elliott 1816. Dichanthelium lanuginosum var. fasciculatum Dichanthelium lanuginosum (Elliott) Gould, var. fasciculatum (Torrey) Spellenberg, Madroño 23: 145. 1975. 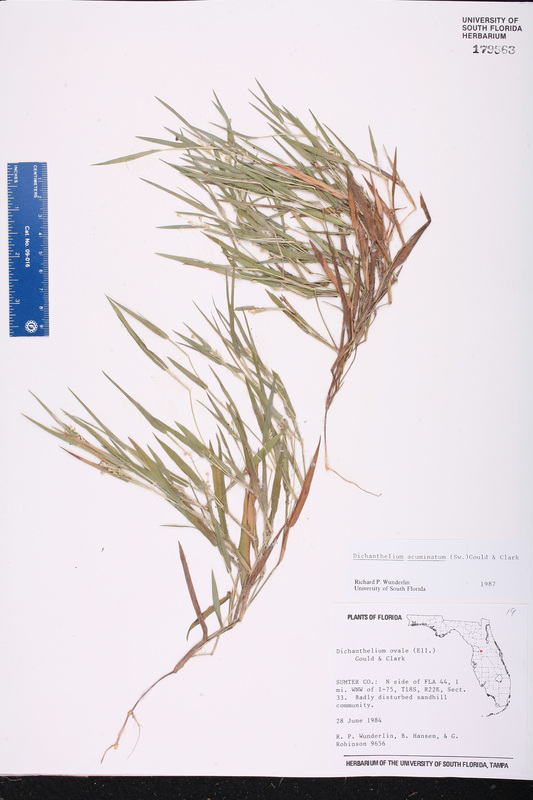 BASIONYM: Panicum dichotomum Linnaeus, var. fasciculatum Torrey 1824. Dichanthelium lanuginosum var. villosissimum Dichanthelium lanuginosum (Elliott) Gould, var. villosissimum (Nash) Gould, Brittonia 26: 60. 1974. 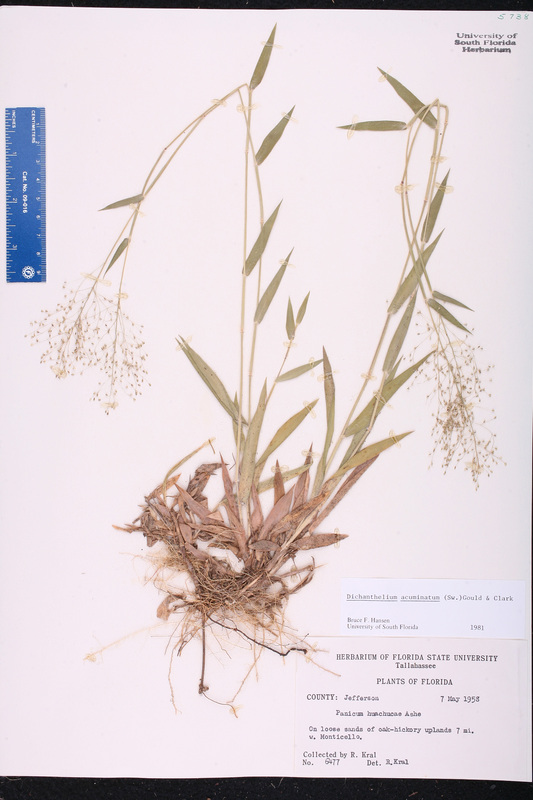 BASIONYM: Panicum villosissimum Nash 1896. Dichanthelium meridionale Dichanthelium meridionale (Ashe) Freckmann, Phytologia 39: 270. 1978. BASIONYM: Panicum meridionale Ashe 1898. Dichanthelium ovale subsp. pseudopubescens Dichanthelium ovale (Elliott) Gould & C. A. Clark, subsp. pseudopubescens (Nash) Freckmann & Lelong, Sida 20: 170. 2002. BASIONYM: Panicum pseudopubescens Nash 1899. Dichanthelium ovale subsp. villosissimum Dichanthelium ovale (Elliott) Gould & C. A. Clark, subsp. villosissimum (Nash) Freckmann & Lelong, Sida 20: 170. 2002. 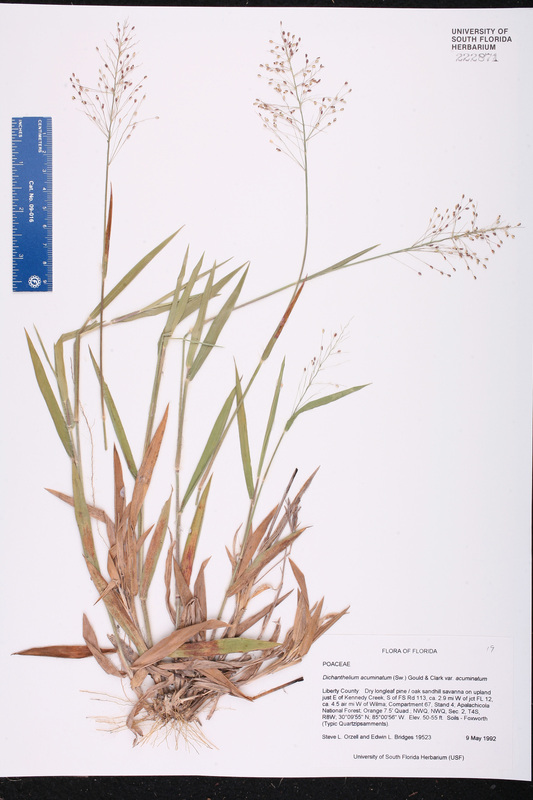 BASIONYM: Panicum villosissimum Nash 1896. Dichanthelium ovale var. 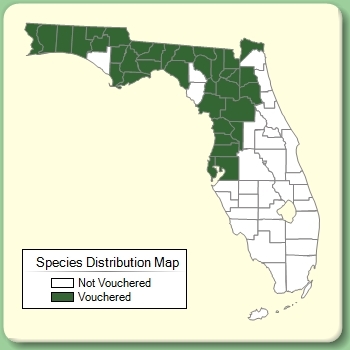 addisonii Dichanthelium ovale (Elliott) Gould & C. A. Clark, var. addisonii (Nash) Gould & C. A. Clark, Ann. Missouri Bot. Gard. 65: 1115. 1978. BASIONYM: Panicum addisonii Nash 1898. Dichanthelium villosissimum Dichanthelium villosissimum (Nash) Freckmann, Phytologia 39: 270. 1978. 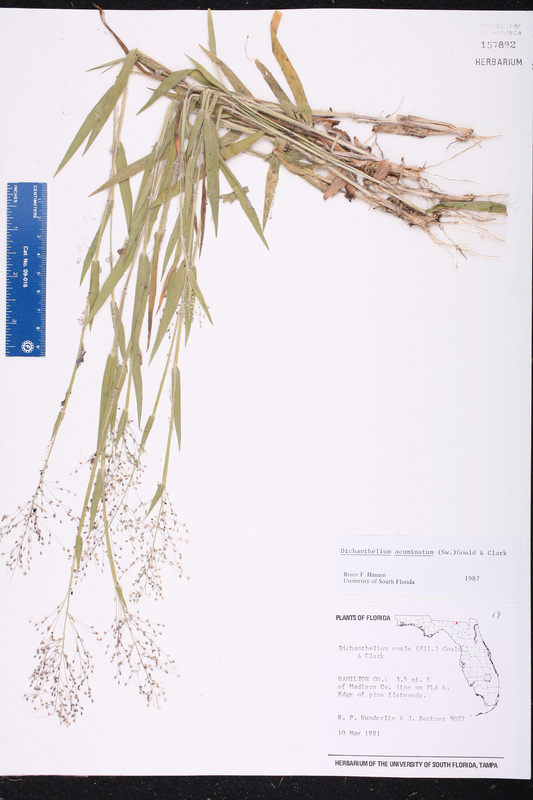 BASIONYM: Panicum villosissimum Nash 1896. Dichanthelium villosissimum var. pseudopubescens Dichanthelium villosissimum (Nash) Freckmann, var. pseudopubescens (Nash) Mohlenbrock, Erigenia 6: 26. 1985. BASIONYM: Panicum pseudopubescens Nash 1899. Panicum acuminatum Panicum acuminatum Swartz, Prodr. 23. 1788. TYPE: JAMAICA: Without data, Swartz s.n. (holotype: S; isotype: US fragm). Panicum acuminatum var. fasciculatum Panicum acuminatum Swartz, var. fasciculatum (Torrey) Lelong, Brittonia 36: 169. 1984. 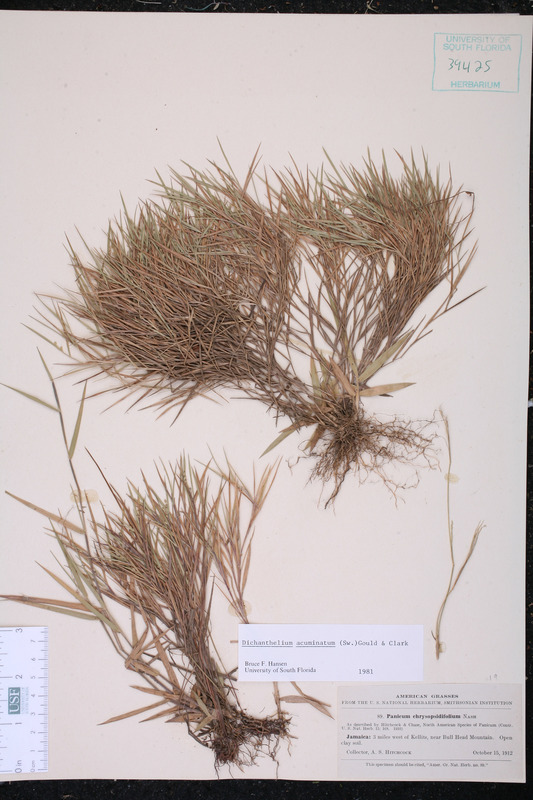 BASIONYM: Panicum dichotomum Linnaeus, var. fasciculatum Torrey 1824. Panicum acuminatum var. implicatum Panicum acuminatum Swartz, var. implicatum (Lamson-Scribner) Beetle, Phytologia 48: 192. 1981. BASIONYM: Panicum implicatum Lamson-Scribner 1898. Panicum acuminatum var. villosum Panicum acuminatum Swartz, var. villosum (A.Gray) Beetle, Phytologia 48: 192. 1981. BASIONYM: Panicum nitidum Lamarck, var. villosum A. Gray 1835. Panicum addisonii Panicum addisonii Nash, Bull. Torrey Bot. Club 25: 83. 1898. TYPE: NEW JERSEY: Cape Mahy Co.: Wildwood, 30-31 May 1897, Bicknell s.n. (holotype: NY; isotype: US fragm). Panicum alabamense Panicum alabamense Ashe, Bull. N. Carolina Agric. Exp. Sta. 175: 116. 1900, non Trinius ex Steudel 1854. TYPE: ALABAMA: Lee Co.: Auburn, 7 May 1898, Alabama Biol. Surv. 1530 (holotype: NCU; isotypes: NY, US). Panicum albemarlense Panicum albemarlense Ashe, J. Elisha Mitchell Sci. Soc. 16: 84. 1900. TYPE: NORTH CAROLINA: Beauford or Hyde Co.: Without locality, s.d., Ashe s.n. (lectotype: US). Lectotypified by Hitchcock & Chase, Contr. U.S. Natl. Herb. 15: 212. 1910. Panicum auburne Panicum auburne Ashe, Bull. N. Carolina Agric. Exp. Sta. 175. 115. 1900. TYPE: ALABAMA: Lee Co.: Auburn, 7 May 1898, Earle & Baker 1527 (holotype: NCU; isotype: US). Panicum chrysopsidifolium Panicum chrysopsidifolium Nash, in Small, Fl. S.E. U.S. 100, 1327. 1903. TYPE: FLORIDA: Leon Co.: Lake Jackson, 12 May 1886, Curtiss D (holotype: NY). Panicum ciliosum Panicum ciliosum Nash, Bull. Torrey Bot. Club 26: 568. 1899. TYPE: MISSISSIPPI: Harrison Co.: Biloxi, 1 Sep 1898, Tracy 4580 (holotype: NY; isotypes: NCU, US). Panicum columbianum var. commonsianum Panicum columbianum Lamson-Scribner, var. commonsianum (Ashe) Dore, in McNeill & Dore, Naturaliste Canad. 103: 562. 1976. BASIONYM: Panicum commonsianum Ashe 1898. Panicum commonsianum Panicum commonsianum Ashe, J. Elisha Mitchell Sci. Soc. 15: 55. 1898. TYPE: NEW JERSEY: Cape May Co.: Cape May, Jun 1898, Commons 341 (holotype: NCU; isotypes: NY, US). Panicum commonsianum subsp. 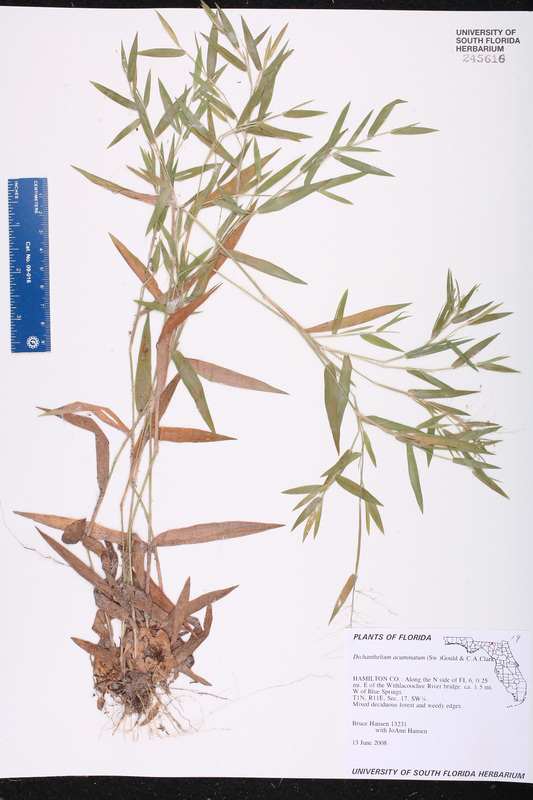 addisonii Panicum commonsianum Ashe, subsp. addisonii (Nash) W. Stone, Pl. S. New Jersey 205. 1912. 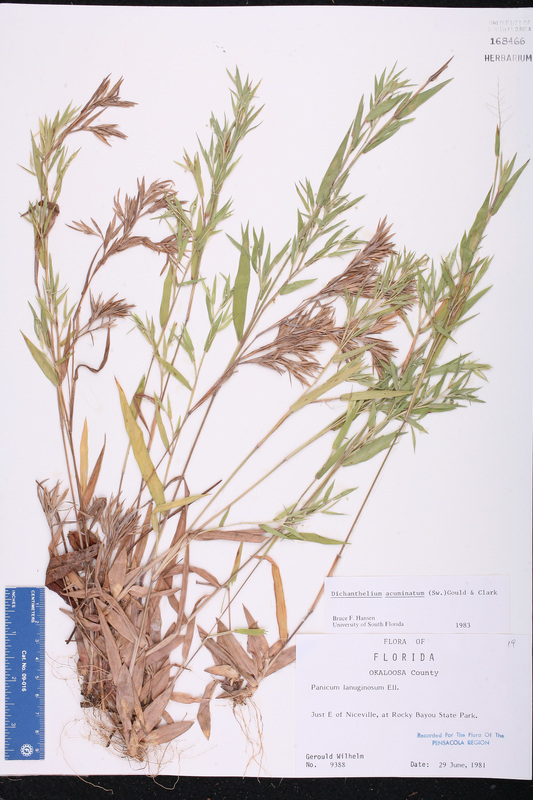 BASIONYM: Panicum addisonii Nash 1898. Panicum commonsianum var. addisonii Panicum commonsianum Ashe, var. addisonii (Nash) Pohl, Amer. Midl. Naturalist 38: 582. 1947. BASIONYM: Panicum addisonii Nash 1898. Panicum dichotomum var. 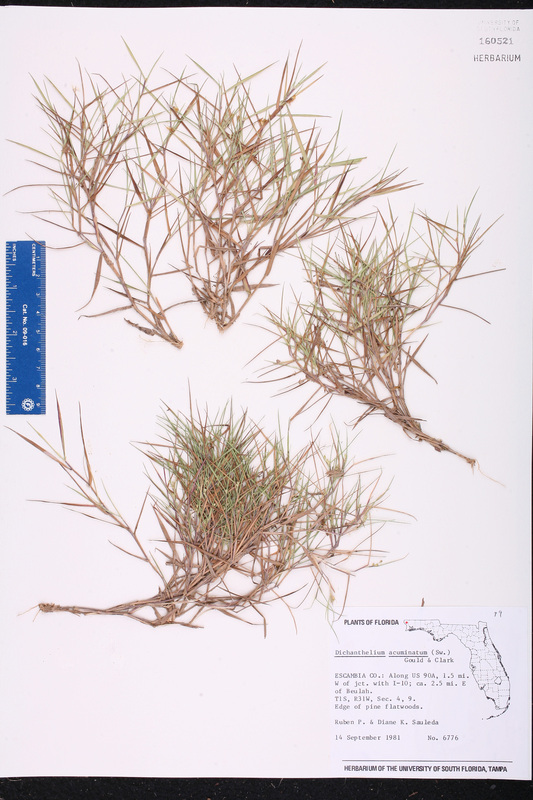 fasciculatum Panicum dichotomum Linnaeus, var. 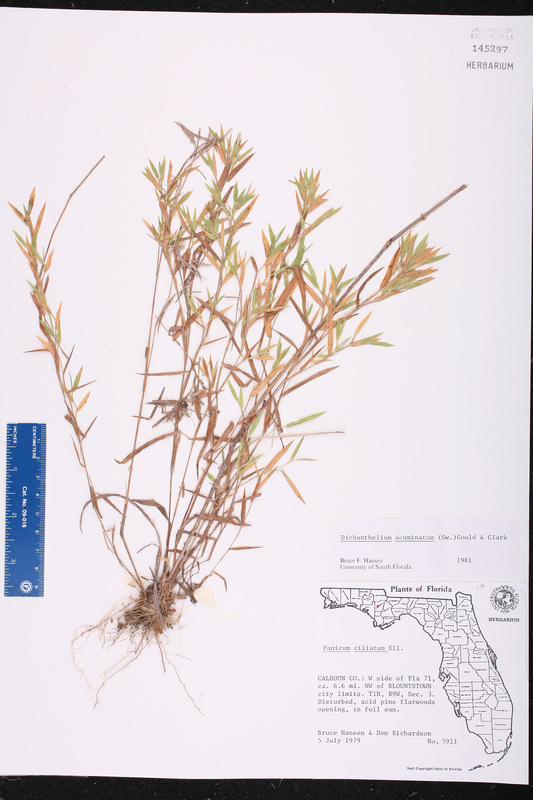 fasciculatum Torrey, Fl. N. Middle United States 145. 1824. TYPE: NEW JERSEY: Without data, Torrey s.n. (holotype: NY). Panicum dichotomum var. lanuginosum Panicum dichotomum Linnaeus, var. lanuginosum (Elliott) A. W. Wood, Class-Book Bot., ed. 1861. 786. 1861. BASIONYM: Panicum lanuginosum Elliott 1816. Panicum filiculme Panicum filiculme Ashe, J. Elisha Mitchell Sci. Soc. 15: 59. 1898, non Hackel 1895. TYPE: GEORGIA: DeKalb Co.: Stone Mountain, Aug 1895, Ashe s.n. (lectotype: NCU). Lectotypified by LeBlond, Phytoneuron 2015(34): 5. 2015. Panicum funstonii Panicum funstonii Lamson-Scribner & Merrill, U.S.D.A. Div. Agrost. Circ. 35: 4. 1901. TYPE: CALIFORNIA: Tulare Co.: Bank of Kaweah River at Three Rivers, 26 Jul 1891, Coville & Funston 1286 (holotype: US). Panicum huachucae Panicum huachucae Ashe, J. Elisha Mitchell Sci. Soc. 15: 51. 1898. TYPE: ARIZONA: Huachuca Mts., 1882, Lemmon s.n. (lectotype: US). Lectotypified by Hitchcock & Chase, Contr. U.S. Natl. Herb. 15: 215. 1910. Panicum huachucae var. fasciculatum Panicum huachucae Ashe, var. fasciculatum (Torrey) F. T. Hubbard, Rhodora 14: 171. 1912. 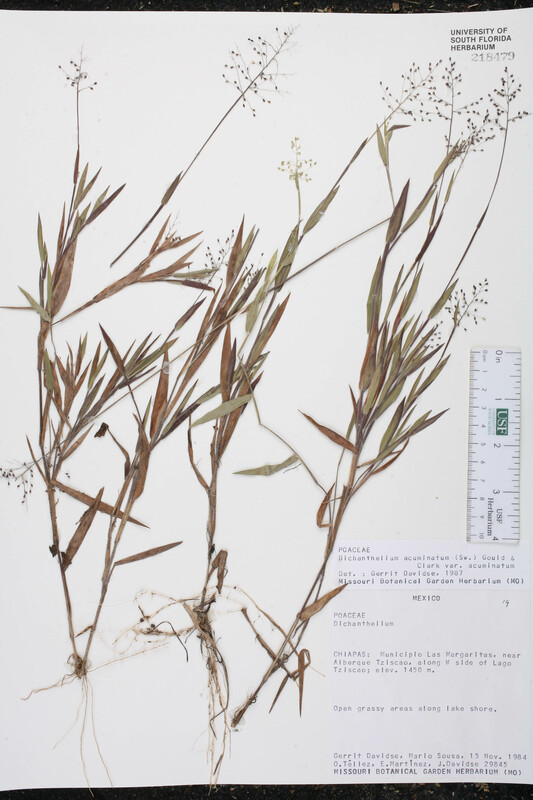 BASIONYM: Panicum dichotomum Linnaeus, var. fasciculatum Torrey 1824. Panicum implicatum Panicum implicatum Lamson-Scribner, Bull. Div. Agrostol., U.S.D.A 11: 43. 1898. TYPE: MAINE: Cumberland Co.: Cape Elizabeth, 26-27 Jul 1895, Lamson-Scribner s.n. (holotype: US; isotype: NY). Panicum lanuginosum Panicum lanuginosum Elliott, Sketch Bot. S. Carolina 1: 123. 1816. TYPE: GEORGIA: Without data, Baldwin s.n. (holotype: CHARL; isotype: US fragm). Panicum lanuginosum subvar. meridionale Panicum lanuginosum Elliott, subvar. meridionale (Ashe) Farwell, Pap. Michigan Acad. Sci. 26: 5. 1941. BASIONYM: Panicum meridionale Ashe 1898. Panicum lanuginosum var. fasciculatum Panicum lanuginosum Elliott, var. fasciculatum (Torrey) Fernald, Rhodora 36: 77. 1934. 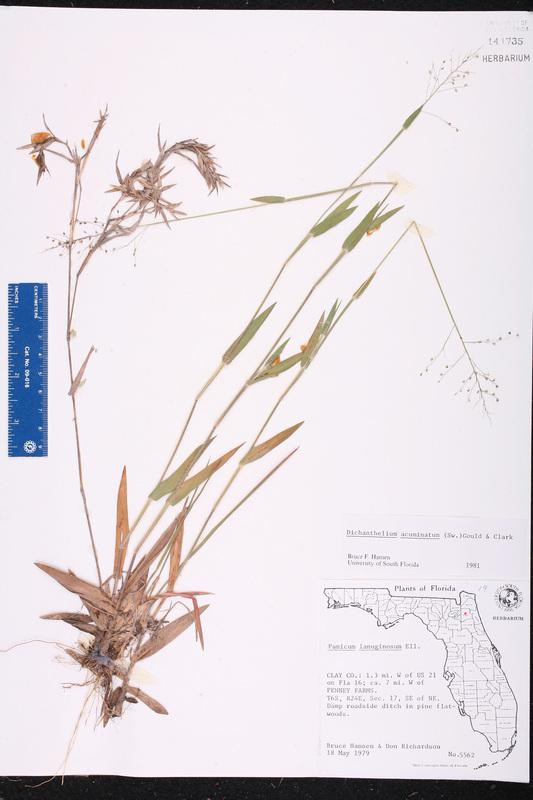 BASIONYM: Panicum dichotomum Linnaeus, var. fasciculatum Torrey 1824. Panicum lanuginosum var. huachucae Panicum lanuginosum Elliott, var. huachucae (Ashe) Hitchcock, Rhodora 8: 208. 1906. BASIONYM: Panicum huachucae Ashe 1898. Panicum lanuginosum var. implicatum Panicum lanuginosum Elliott, var. implicatum (Lamson-Scribner) Fernald, Rhodora 36: 77. 1934. BASIONYM: Panicum implicatum Lamson-Scribner 1898. Panicum lindheimeri subvar. meridionale Panicum lindheimeri Nash, subvar. meridionale (Ashe) Farwell, Amer. Midl. Naturalist 11: 45. 1928. BASIONYM: Panicum meridionale Ashe 1898. Panicum lindheimeri var. fasciculatum Panicum lindheimeri Nash, var. fasciculatum (Torrey) Fernald, Rhodora 23: 228. 1922 ("1921"). 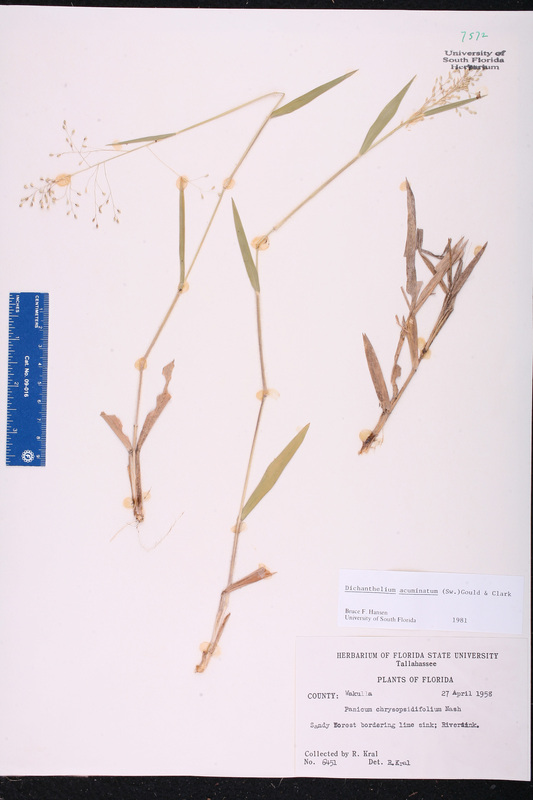 BASIONYM: Panicum dichotomum Linnaeus, var. fasciculatum Torrey 1824. Panicum lindheimeri var. implicatum Panicum lindheimeri Nash, var implicatum (Lamson-Scribner) Fernald, Rhodora 23: 228. 1922 ("1921"). BASIONYM: Panicum implicatum Lamson-Scribner 1898. Panicum lindheimeri var. tennesseense Panicum lindheimeri Nash, var. tennesseense (Ashe) Farwell, Amer. Midl. Naturalist 11: 45. 1928. BASIONYM: Panicum tennesseense Ashe 1898. Panicum meridionale Panicum meridionale Ashe, J. Elisha Mitchell Sci. Soc. 15: 59. 1898. TYPE: NORTH CAROLINA: Burke Co.: Jonas Ridge, Jun 1893, Ashe s.n. (lectotype: US). Lectotypified by Hitchcock & Chase, Contr. U.S. Natl. Herb. 15: 210. 1910. 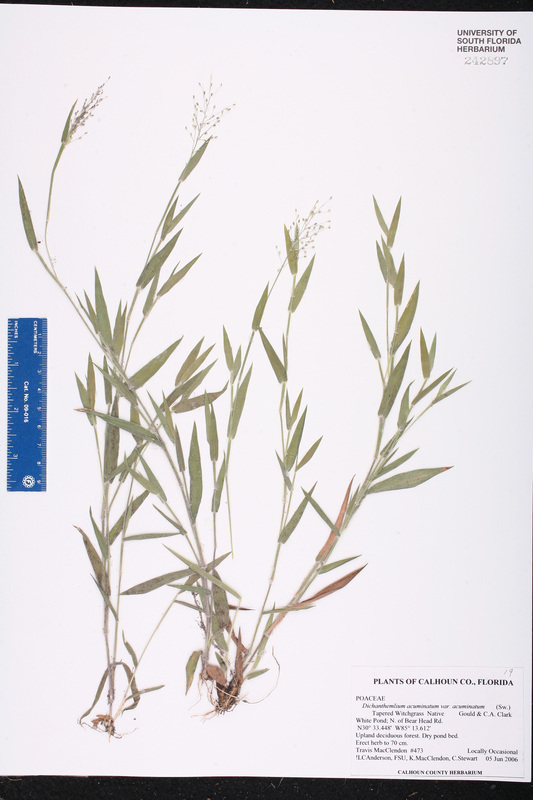 Panicum meridionale var. albemarlense Panicum meridionale Ashe, var. albemarlense (Ashe) Fernald, Rhodora 36: 76. 1934. BASIONYM: Panicum albemarlense Ashe 1898. Panicum nitidum var. villosum Panicum nitidum Lamarck, var. villosum A. Gray, N. Amer. Gram. 2: 111. 1835. TYPE: NEW YORK: Ontario Co.: Without locality, s.d., Sartwell s.n. holotype: GH). Panicum occidentale Panicum occidentale Lamson-Scribner, Rep. (Annual) Missouri Bot. Gard. 10: 48. 1899. TYPE: CANADA: British Columbia: Vancouver Island, "Hab. in Nootka-Sund", s.d., Haenke s.n. (holotype: MO? ; isotypes: PR, US fragm). Panicum orangense Panicum orangense Ashe, J. Elisha Mitchell Sci. Soc. 15: 113. 1899. TYPE: NORTH CAROLINA: Orange Co.: Chapel Hill, 29 Jun 1898, Ashe s.n. (lectotype: US). Lectotypified by Hitchcock & Chase, Contr. U.S. Natl. Herb. 15: 220. 1910. Panicum ovale var. addisonii Panicum ovale Elliott, var. addisonii (Nash) C. F. Reed, Phytologia 67: 452. 1989. BASIONYM: Panicum addisonii Nash 1898. Panicum ovale var. 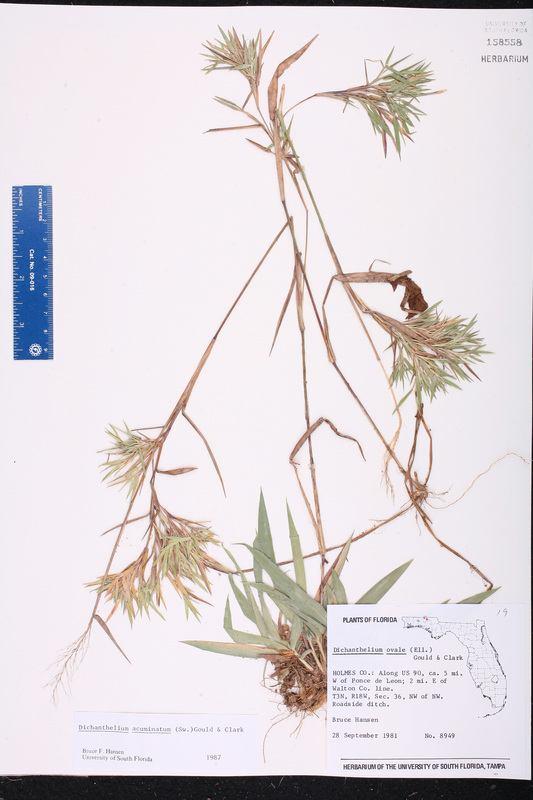 praecocius Panicum ovale Elliott, var. praecocius (Hitchcock & Chase) Wipff, Sida 20: 1044. 2003. BASIONYM: Panicum praecocius Hitchcock & Chase 1906. Panicum ovale var. pseudopubescens Panicum ovale Elliott, var. pseudopubescens (Nash) Lelong, Brittonia 36: 271. 1984. BASIONYM: Panicum pseudopubescens Nash 1899. 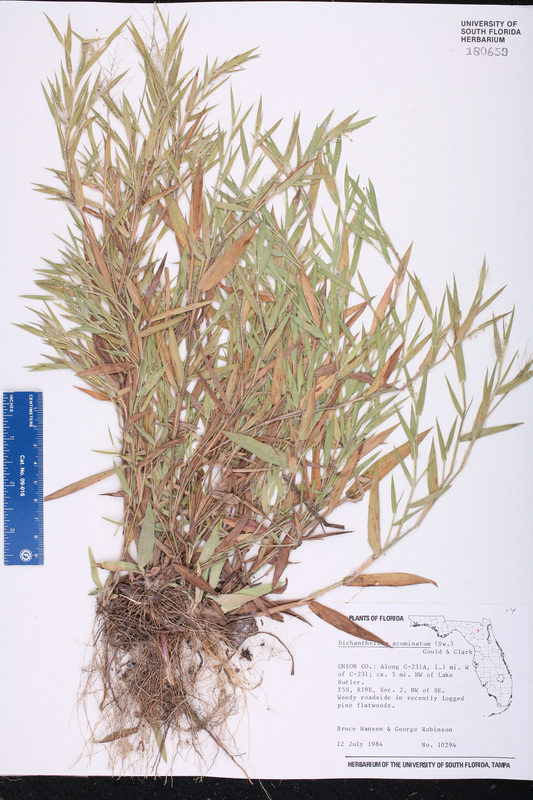 Panicum ovale var. villosum Panicum ovale Elliott, var. villosum (A. Gray) Lelong, Brittonia 36: 272. 1984. BASIONYM: Panicum nitidum Lamarck, var. villosum A. Gray 1835. Panicum pseudopubescens Panicum pseudopubescens Nash, Bull. Torrey Bot. Club 26: 577. 1899. TYPE: ALABAMA: Lee Co.: Auburn, 7 May 1898, Earle & Baker 1537 (holotype: NY; isotype: US). Panicum tennesseense Panicum tennesseense Ashe, J. Elisha Mitchell Sci. Soc. 15: 52. 1898. TYPE: TENNESSEE: La Vergne Co.: Without locality, 7 Aug 1897, Biltmore Herb. 7087 (holotype: US). Panicum unciphyllum var. implicatum Panicum unciphyllum Trinius, var. implicatum (Lamson-Scribner) Lamson-Scribner & Merrill, Rhodora 3: 12. 1901. BASIONYM: Panicum implicatum Lamson-Scribner 1898. Panicum unciphyllum var. meridionale Panicum unciphyllum Trinius, var. meridionale (Ashe) Lamson-Scribner & Merrill, Rhodora 3: 123. 1901. BASIONYM: Panicum meridionale Ashe 1898. Panicum villosissimum Panicum villosissimum Nash, Bull. Torrey Bot. Club 23: 149. 1896. TYPE: GEORGIA: Bibb Co.: Ocmulgee River swamp, below Macon, 18-24 May 1895, Small s.n. (holotype: NY; isotypes: NY, US). Panicum villosissimum var. pseudopubescens Panicum villosissimum Nash, var. pseudopubescens (Nash) Fernald, Rhodora 36: 79. 1934. BASIONYM: Panicum pseudopubescens Nash 1899. Dichanthelium acuminatum var. thurowii Dichanthelium acuminatum (Swartz) Gould & C. A. Clark, var. thurowii (Lamson- Scribner & J. G. Smith) Gould & C. A. Clark, Ann. Missouri Bot. Gard. 65: 1125. 1978. BASIONYM: Panicum thurowii Lamson-Scribner & J. G. Smith 1899. Dichanthelium ovale subsp. praecocius Dichanthelium ovale (Elliott) Gould & C. A. Clark, subsp. praecocius (Hitchcock & Chase) Freckmann & Lelong, Sida 20: 170. 2002. BASIONYM: Panicum praecocius Hitchcock & Chase 1906. Dichanthelium scoparioides Dichanthelium scoparioides (Ashe) Mohlenbrock, Erigenia 6: 26. 1985. 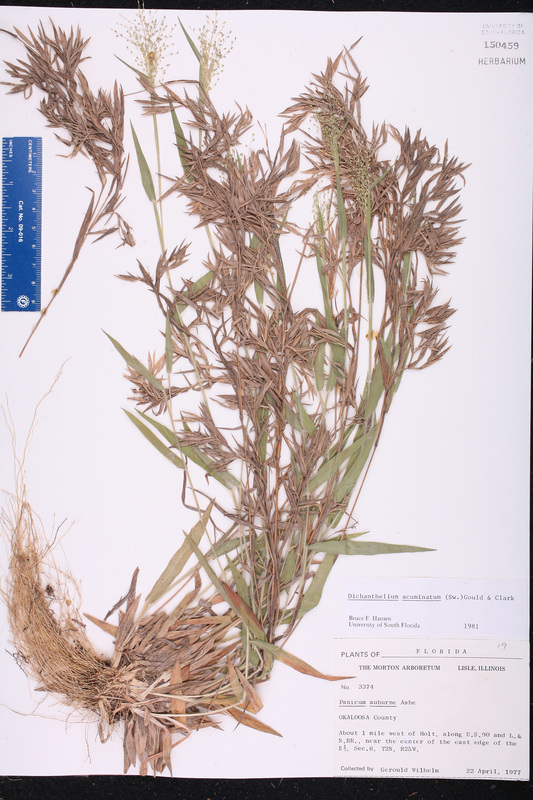 BASIONYM: Panicum scoparioides Ashe 1898. Dichanthelium villosissimum var. praecocius Dichanthelium villosissimum (Nash) Freckmann, var. praecocius (Hitchcock & Chase) Freckmann, Phytologia 39: 270. 1978. BASIONYM: Panicum praecocius Hitchcock & Chase 1906. Panicum acuminatum var. thurowii Panicum acuminatum Swartz, var. thurowii (Lamson-Scribner & J. G. Smith) C. F. Reed, Phytologia 67: 452. 1989. BASIONYM: Panicum thurowii Lamson-Scribner & J. G. Smith 1899. Panicum atlanticum Panicum atlanticum Nash, Bull. Torrey Bot. Club 24: 346. 1897. TYPE: NEW YORK: Bronx: New York Botanical Garden, 24 Jun 1897, Nash s.n. holotype: NY; isotypes: NY, US). Panicum brodiei Panicum brodiei H. Saint John, Fl. S.E. Washington 51. 1937. TYPE: WASHINGTON: Whitman Co.: Wawai, Snake River, Jun 1893, Brodie s.n. (holotype: WS). Panicum columbianum var. oricola Panicum columbianum Lamson-Scribner, var. oricola (Hitchcock & Chase) Fernald, Rhodora 36: 79. 1934. BASIONYM: Panicum oricola Hitchcock & Chase 1906. Panicum comophyllum Panicum comophyllum Nash, Bull. Torrey Bot. Club 30: 380. 1903. TYPE: PUERTO RICO: Santurce, 9 Jan 1899, Heller & Heller 12 (holotype: NY). Panicum dichotomum var. villosum Panicum dichotomum Linnaeus, var. villosum Vasey, Bull. Div. Agrostol., U.S.D.A. 8: 31. 1889. TYPE: DISTRICT OF COLUMBIA: Near Pierce's Mill, Rock Creek, 1 Jul 1883, Vasey s.n. (lectotype: US). Lectotypified by Hitchcock & Chase, Contr. U.S. Natl. Herb. 15: 233. 1910. Panicum glutinoscabrum Panicum glutinoscabrum Fernald, Rhodora 49: 122. 1947. TYPE: VIRGINIA: Nansemond Co.: Ca. 1/2 mi. W of Kilby, 8-12 Sep 1946, Fernald et al. 15186 (holotype: GH; isotype: PH). Panicum haemacarpon Panicum haemacarpon Ashe, J. Elisha Mitchell Sci. Soc. 15: 55. 1898. TYPE: DISTRICT OF COLUMBIA: Without locality, 1897, Kearney s.n. (lectotype: NCU; isotypes: NY, US). Lectotypified by Hitchcock & Chase, Contr. U.S. Natl. Herb. 15: 233. 1910. Panicum huachucae var. silvicola Panicum huachucae Ashe, var. silvicola Hitchcock & Chase, in B. L. Robinson, Rhodora 10: 64. 1908. TYPE: DISTRICT OF COLUMBIA: Without locality, 28 Jun 1904, Chase 2400 (holotype: US). Panicum languidum Panicum languidum Hitchcock & Chase, Contr. U.S. Natl. Herb. 15: 232. 1910. BASIONYM: Panicum unciphyllum Trinius, forma prostratum Lamson-Scribner & Merrill 1901. Panicum lanuginosum subvar. pilosum Panicum lanuginosum Elliott, subvar. pilosum (Torrey) Farwell, Pap. Michigan Acad. Sci. 26: 5. 1941. BASIONYM: Panicum nitidum Lamarck, var. pilosum Torrey 1824. Panicum lanuginosum var. 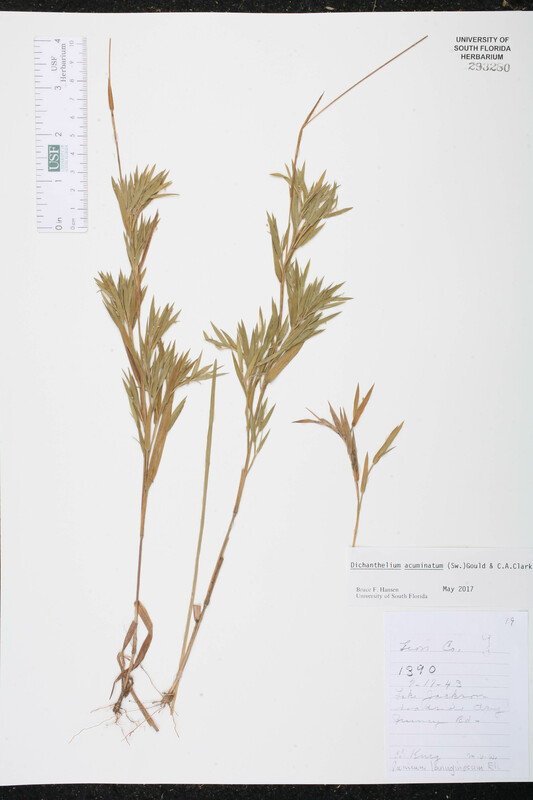 praecocius Panicum lanuginosum Elliott, var. praecocius (Hitchcock & Chase) Dore, in McNeill & Dore, Naturaliste Canad. 103: 576. 1976. BASIONYM: Panicum praecocius Hitchcock & Chase 1906. Panicum lanuginosum var. septentrionale Panicum lanuginosum Elliott, var. septentrionale (Fernald) Fernald, Rhodora 36: 77. 1934. BASIONYM: Panicum lindheimeri Nash, var. septentrionale Fernald 1921. Panicum lanuginosum var. siccanum Panicum lanuginosum Elliott, var. siccanum Hitchcock & Chase, Rhodora 8: 207. 1906. TYPE: ILLINOIS: LaSalle Co.: Starved Rock, 1 Jul 1901, Chase 1602 holotype: US). Panicum lassenianum Panicum lassenianum Schmoll, Madroño 5: 95. 1939. TYPE: CALIFORNIA: Plumas Co.: Devil's Kitchen, Hot Spring Valley, s.d., Jepson 4082 (holotype: US). Panicum lindheimeri var. septentrionale Panicum lindheimeri Nash, var. septentrionale Fernald, Rhodora 23: 227. 1921. TYPE: CANADA: New Brunswick: St. John River, Woodstock, 14 Jul 1916, Fernald & Long 12527 (holotype: GH). 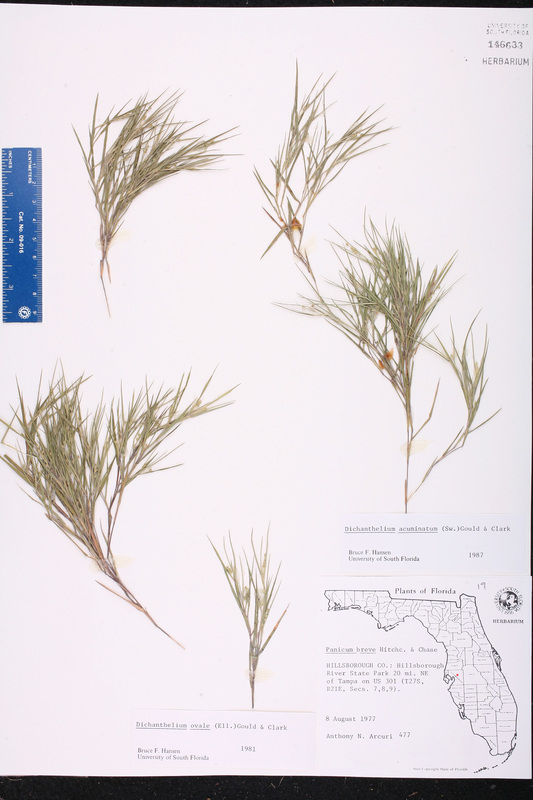 Panicum microphyllum Panicum microphyllum Ashe, J. Elisha Mitchell Sci. Soc. 15: 61. 1898. TYPE: NORTH CAROLINA: Orange Co.: Chapel Hill, Jun 1898, Ashe s.n. (lectotype: NY; isolectotype: US(fragm)). Lectotypified by LeBlond, Phytoneuron 2015(34): 7. 2015. 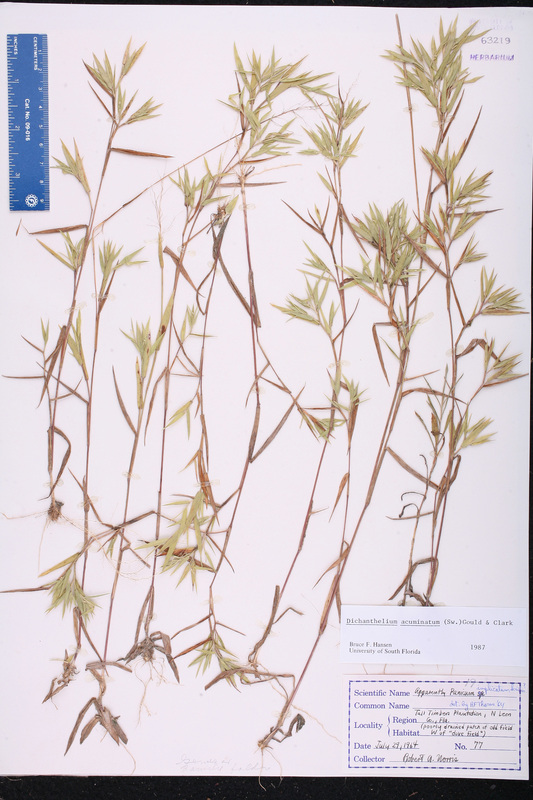 Panicum mundum Panicum mundum Fernald, Rhodora 38: 392, pl. 443(1-5). 1936. TYPE: VIRGINIA: Sussex Co.: 4 mi. NW of Homeville, 25 Aug 1936, Fernald & Long 6499 (holotype: GH; isotypes: MO, NY, US). Panicum nitidum var. ciliatum Panicum nitidum Lamarck, var. 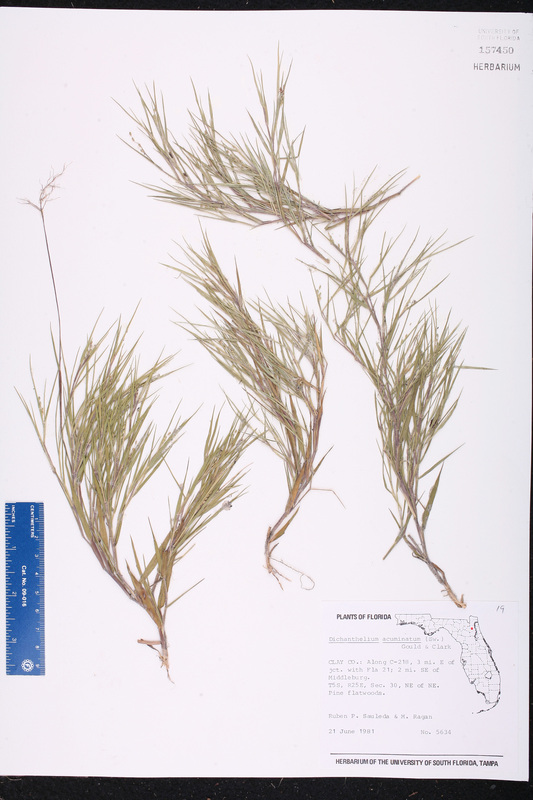 ciliatum Torrey, Fl. N. Middle United States 146. 1824. TYPE: NEW JERSEY: Without data, Torrey s.n. (holotype: NY; isotype: US fragm). Panicum nitidum var. pilosum Panicum nitidum Lamarck, var. pilosum Torrey, Fl. N. Middle United States 146. 1824. TYPE: NEW YORK: Without data, Torrey s.n. (holotype: NY; isotype: US fragm). Panicum olivaceum Panicum olivaceum Hitchcock & Chase, Contr. U.S. Natl. Herb. 15: 225. 1910. TYPE: GUATEMALA: Alta Verapaz: Coban, Feb 1888, Tuerckheim 428 (holotype: US). Panicum oricola Panicum oricola Hitchcock & Chase, Rhodora 8: 208. 1906. TYPE: DELAWARE: Sussex Co.: Lewes, 18 Jun 1905, Hitchcock 47 (holotype: US; isotypes: MO, NY). Panicum oweniae Panicum oweniae E. P. Bicknell, Bull. Torrey Bot. Club 35: 185. 1908. TYPE: MASSACHUSETTS: Nantucket Co.: W of Nantucket, 20 Sep 1907, Bicknell s.n. (holotype: NY; isotypes: NY, US). Panicum pacificum Panicum pacificum Hitchcock & Chase, Contr. U.S. Natl. Herb. 15: 229. 1910. TYPE: CALIFORNIA: Shasta Co.: Castle Crag, 1/4 mi. E of hotel, 3 Aug 1908, Hitchcock 3070 (holotype: US). Panicum praecocius Panicum praecocius Hitchcock & Chase, Rhodora 8: 206. 1906. TYPE: ILLINOIS: Stark Co.: Near Wady Petra, 30 Jun 1900, Chase 649 holotype: US). Panicum scoparioides Panicum scoparioides Ashe, J. Elisha Mitchell Sci. Soc. 15: 53. 1898. TYPE: DELAWARE: Newcastle Co.: Centreville, 25 Jun 1873, Commons 283 (lectotype: US; isotype: NY). Lectotypified by Hitchcock & Chase, Contr. U.S. Natl. Herb. 15: 238. 1910. Panicum subvillosum Panicum subvillosum Ashe, J. Elisha Mitchell Sci. Soc. 16: 86. 1900. TYPE: MINNESOTA: Carlton Co.: Carlton, Aug, Ashe s.n. (lectotype: US(fragm); isolectotypes: NCU, US). Lectotypified by LeBlond, Phytoneuron 2015(34): 9. 2015. Panicum thurowii Panicum thurowii Lamson-Scribner & J. G. Smith, in Lamson-Scribner, Circ. Div. Agrostol., U.S.D.A. 16: 5. 1899. TYPE: TEXAS: Waller Co.: Without locality, 5 Jun 1898, Thurow 9 (holotype: US). Panicum unciphyllum forma pilosum Panicum unciphyllum Trinius, forma pilosum Lamson-Scribner & Merrill, Rhodora 3: 124. 1901. TYPE: MAINE: Penobscot Co.: Orono, 7 Jul 1891, Fernald 501 (holotype: GH). Panicum unciphyllum forma prostratum Panicum unciphyllum Trinius, forma prostratum Lamson-Scribner & Merrill, Rhodora 3: 124. 1901. TYPE: MAINE: York Co.: South Berwick, 26 Sep 1897, Fernald s.n. (holotype: GH). Panicum villosissimum var. scoparioides Panicum villosissimum Nash, var. scoparioides (Ashe) Fernald, Rhodora 36: 79. 1934. 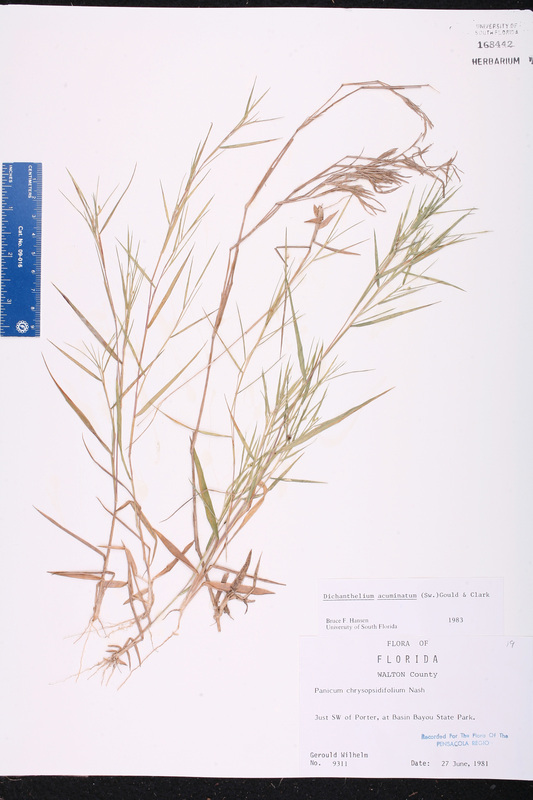 BASIONYM: Panicum scoparioides Ashe 1898. Panicum wilmingtonense Panicum wilmingtonense Ashe, J. Elisha Mitchell Sci. Soc. 16: 86. 1900. TYPE: NORTH CAROLINA: New Hanover Co.: Near Wilmington, 17 May 1899, Ashe s.n. (holotype: NCU; isotype: US). Panicum xanthospermum Panicum xanthospermum Lamson-Scribner & C. Mohr, in C. Mohr, Contr. U.S. Natl. Herb. 6: 348. 1901. TYPE: ALABAMA: Butler Co.: Greenville, 8 May 1898, Mohr s.n. (holotype: US).